Will we see the internet juggernaut selling these online? Rivian will get a whopping $700 million from Amazon, a huge sum as well as noteworthy involvement from one of the biggest companies in the world. Talks with General Motors are also underway for investment and/or future collaboration on an electric vehicle(s). Rivian just unveiled an all-electric R1T pickup truck and R1S SUV, both with supercar-level acceleration, as well as ingenious storage options. The R1T isn't just long-range impressive, it's really quite stylish. A few weeks ago, EV startup Rivian announced both their radical R1T pickup and R1S SUV to the amazement of the automotive industry and the car-loving pubic, in general. Both vehicles boast tremendous power, efficiency, and utility, as well as great design. Now, it seems Amazon has taken notice. 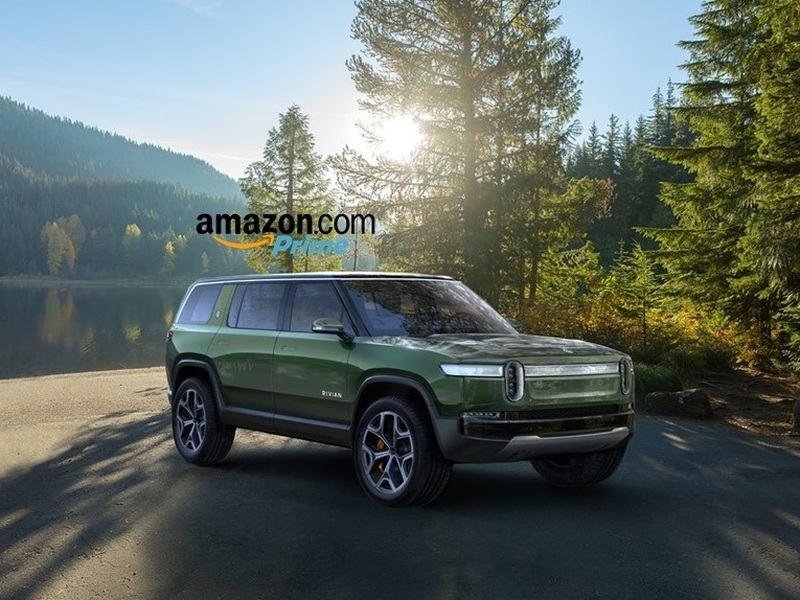 Reuters recently reported that both Amazon and General Motors were both planning to invest in Rivian, "in a deal that would value the US electric pickup truck manufacturer at between $1 billion and $2 billion." Amazon has since invested a colossal $700 million in the startup, while talks with GM continue. It's not just the staggering amount of money but the Amazon name that has such tremendous cache. It means Rivian has not just real money but real credibility. The R1S SUV promises room for seven, gobs of storage, and 400 miles of EV range. And though this may be a bit of a gut punch to Tesla, who still hasn't unveiled their much-touted EV pickup truck, Telsa has been killing it of late. As of the third quarter of 2018, Elon Musks company has been turning a profit and has also met production and delivery objectives, something everyone (including us) laughed at before. Telsa has gone from missing every production objective and process woes to making 80,000 vehicles per quarter and outselling the likes of BMW, Porsche, and Mercedes-Benz. Telsa, in fact, can now claim that they build the best-selling domestically made car in America, the Model 3. Rivian has a ways to go before they can even come close to making such claims since their vehicles aren't even for sale yet. But what Rivian does have on its hands, aside from the backing of Amazona and potentially GM, is a working SUV and pickup, neither of which will be nearly as pricey or quirky as the Tesla Model X SUV. They were brilliant to start our their lineup with two of the most popular segments in the automotive industry. Plus, when they do actually start selling them, they'll have the benefit of IRS tax credits ($7,500 per unit) because Rivian hasn't sold any vehicles yet and hasn't tapped into that resource. The R1T pickup's interior is modern, spacious and very original. Supposedly Rivian's battery tech (developed in-house) is 25% more efficient than Tesla's, which is a major claim and a potentially huge selling point. Couple that fact with excellent design that's actually both rugged-looking and attractive, along with brilliant storage options and utility, and you have a recipe for success. If Rivian can bring their R1T pickup to market before Telsa can, that will an important milestone for the brand. Rivian may also be in the process of developing their own sedan/hatchback, which sticks a thumb in the eye of the Model 3. Throw in collaboration from General Motor's deep well of automotive knowledge, and it might be Telsa playing second fiddle.